A friend commented that it's gnocchi that she really wants to learn how to make. I can't blame her. 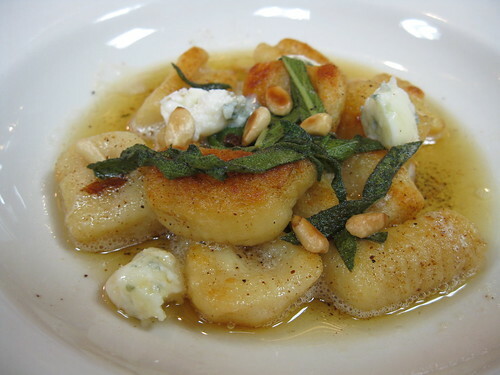 They're delicious and gnocchi with Gorgonzola is one of Greg's absolute favorites as well. They also happen to be one of the easiest pastas to make. They also have the ingredients and steps nicely laid out on the website for easy reference. http://vimeo.com/2121865 -- this one is the most similar to how we did it in class, with the exception that we used a food mill to get the potatoes really smooth. Each one uses slightly different techniques and you might find one you prefer over another. Quick tip: To add the nice crisp texture you see on the exterior of the gnocchi in this picture, we simply pan fried the finished dumplings after they'd been boiled and before adding the sauce.